Good morning and Merry Christmas !! Quick question , My son and I (he is 9 ) are working on the tudor this morning , we are replacing the hood shelves with a pair of used ones that we have and the hood to shelf gap is like 3/4" from top of shelves to bottom of hood when closed. Is this normal or is something wrong ? We checked all the wood blocks in the replacements and they seem like new , the old ones were ok too but the shelves are really rusted out . Thanks in advance for your help. Travis, I don't know if they're all like this, but I just checked mine and I can just slide my index finger between the shelf and the bottom of the hood, so my gap is about 1/2 inch. With everything painted black, the gap is hardly noticeable. That's a lot of gap. You didn't specify the year, but I wonder if you have a low hood on a later car. Note the photo was taken at a slight angle so the measurements could be off (not to mention it was fuzzy as I zoomed in on the louvers). But if you pose your car at the same angle it should give you a good feel if you space is significantly larger or not. I have 3 T's. A 24 Coupe, 1919 Runabout and a 21 Touring. They all have about an average of 3/8" give or take when it comes to the gap between the hood and hood shelves. I think Ford designed the hood this way to allow a good snug fit. Just my opinion. All T's are slightly different when it comes to close body and fit up measurements. 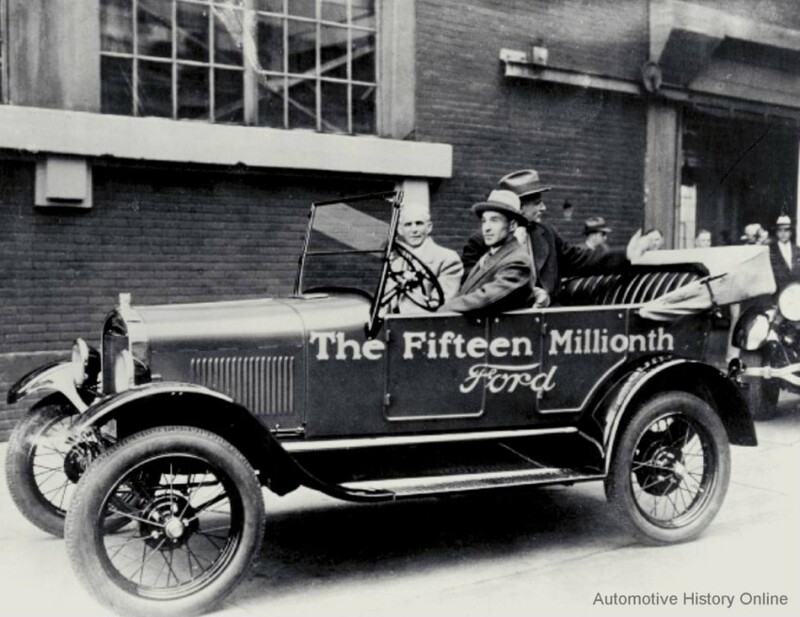 That's the nature of a Model T.
Hap, this is a little off topic but is there a photo of the last Model T to come off the assembly line? I have seen the one before you posted but I was thinking you would know as I always enjoy the in depth info you have. 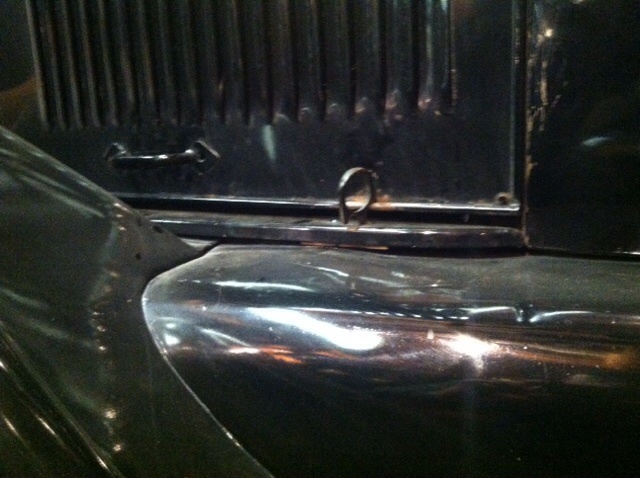 Here is a shot of my 26 Tudor, the gap is about 1/2". Questions. Is the gap the same on both sides? Is it the same in front by the radiator as it is at the back by the body? That hood looks like a 26-27 hood. If your body is a 26-27 the hood should fit. 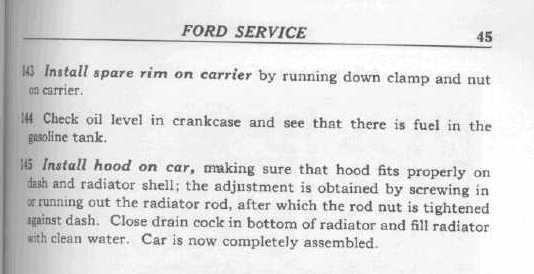 Several things in the following order affect the fit of the hood. 1. straight frame in good alignment. 2. 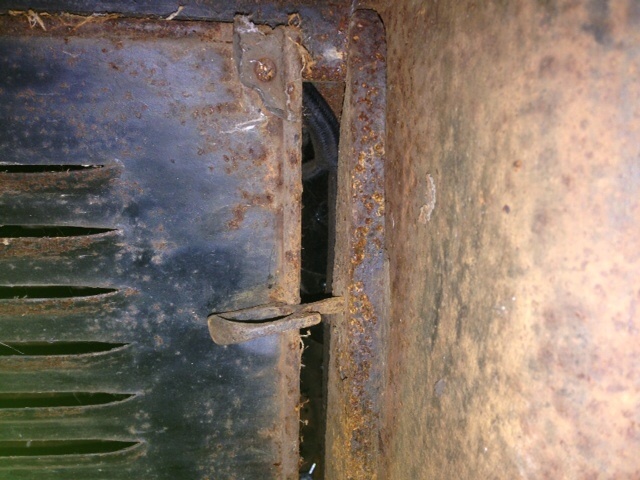 Correct radiator on which the center of the radiator is in alignment with the center of the body. 3. Blocks under the body. If front of the body sits too high or too low, the hood won't fit. Both sides of the body should be the same height above the frame (assuming the frame is straight and aligned. 4. Wood blocks under the hood sills the right height above the fender and splash apron. What I like to do when fitting the body, hood, and radiator, is to start at the front and get the front of the body and radiator aligned and the hood to fit. Next I work on the front doors and then the rear doors. All those adjustments can be made by either planing down or shimming up the body blocks. All this assumes the frame is straight. There is a slight adjustment of the radiator depending on how tight you tighten the studs holding it and whether one is tightened more than the other to center the top of the radiator. Most of the adjustments will be made by the wood blocks under the body and hood sills. If the hood is setting further backward the shelf that the hood sits on might be a bit taller radius just behind the normal place that it should rest. Also check what sort of lacing the car has on the surface between hood and hood former (hood shelf). Perhaps the wrong thickness of lacing was used which although a small amount different, can cause a larger error because that extra thickness might be sitting on the higher back portion of the hood former thus holding it up and thicker lacing tends to sit higher at the points were it is supposed to lay flat. Check the fit of the hood everywhere on top rather than just concentrating on the obvious place that a bad fit then shows up. So the question is: is there a correct measurement for the hood gap? Did Ford specify a measurement for the gap or?? If you are not restoring it and leaving 'the patina' and the latches will come up far enough to grip it, I'd rock on and drive it. No , my question was if there was supposed to be a gap I was replacing my hood shelves and there was a gap before and after . The lacing is probably the biggest issue right now as it has not been replace and is actually doubled over in a couple of places, hood fitment is good as far as the lines go but a bit high towards the cowl due to the lacing . Thanks for all the help. 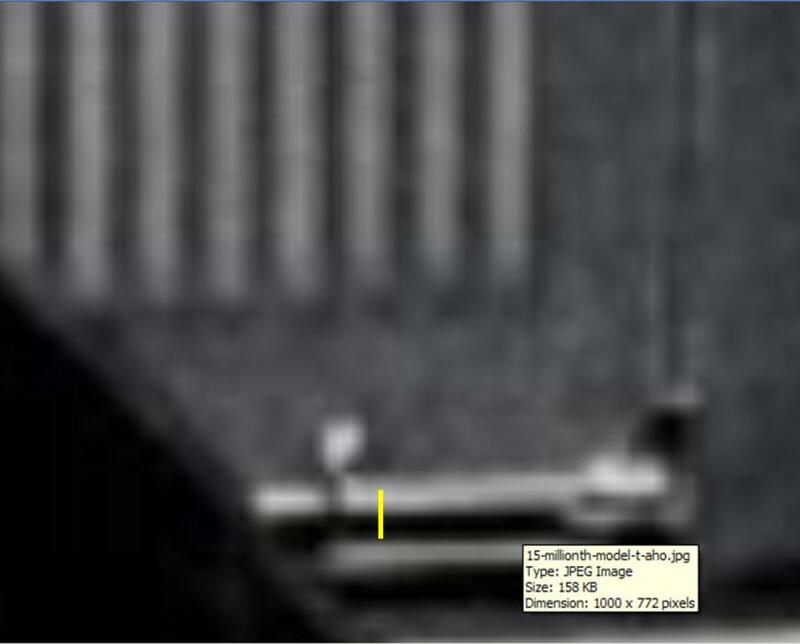 Note that in Mike Vaughn's picture there is a space underneath the hood shelf. I don't see that in yours. The wood blocks under the shelf are thicker than the shelf and hold the shelf up a bit from the fender. That might be 1/8" or so of the discrepancy, and doubled-up hood lacing could be another. If those two situations are present, correcting them would get your gap down to about 1/2", which is about right. That gap makes for one less rattle.
" Did Ford specify a measurement for the gap or??" Can the hood be closed? Yes. Then it's fine, out the door with it. With tongue firmly in cheek. Fit and finish were NOT job number one. John Kuehn (and I think some others also) So the question is: is there a correct measurement for the hood gap? Did Ford specify a measurement for the gap or?? And there it does not make any mention about how wide the gap should normally be. But they were dealing with new parts that included straight frames etc. 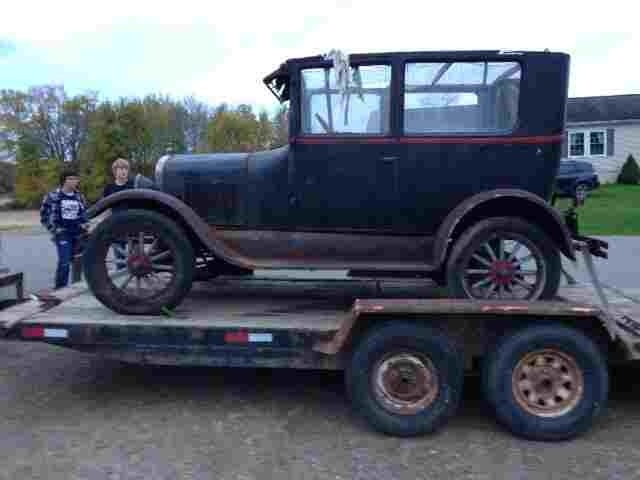 John also asked, ��is there a photo of the last Model T to come off the assembly line?� To keep from high-jacking this thread, I started a new thread with that question at: http://www.mtfca.com/discus/messages/411944/504337.html?1419479083 (And thanks John for the kind words). If you plan to keep this car in the present unrestored condition, don't worry about it. If the hood functions leave it alone. It actually fits very well for the age and unlikely ever having been restored. Thanks. Norm , actually still on the fence of whether to restore or not , fairly original car , was brush painted at one time , last plates are 1952 so assume paint was done thereabouts , found a few cool accessories in the car , moto meter , a cool mascot goose , ac speedometer. Etc ... Actually pretty nice shape for being from pa and stored outside at least 15 yrs that I know of before my acquisition. Kinda like it the way it is , thinking of just doing safety stuff and driving as is for now , still doing a 26 roadster pick up but currently can't stop working on this one , my youngest son and I are really spending a lot of a quality time on it and that makes it all worth it. I envy you and your son's time together. I am retired military and while it was a choice I made I missed a great deal of father/son time. We are trying to make up for lost time but they have their own families now and that, as it should, takes priority. Not whining... Just admire families who play together. John , first of all , thank you for your service ..it takes a special kind of person to serve , secondly I'm sure that you've done an excellent job with your family . All things take time , I have a wife and three sons , full time job and a farm , plus do gun smithing , the Model T hobby is actually relaxing time whenever we can get it and I try to spend a couple hours each week with each of them in their respective interests , my oldest started small bore target shooting , my middle one loves science nd my youngest loves the ford , it's a constant shuffle and always busy to say the least . My father is 62 , and my best friend next to my wife , I am fortunate that we own and work the farm together so I see him practically everyday. We don't just hang around like we used to due to lack of time , but he has a couple of TT trucks that we are going to start restoring . He bought them 20 yrs ago and has been inspired by my sons interest of all things . We all have to do what we have to do in regards to the paths we take , but none of us are guaranteed a second so we have to do the best we can with what we have and keep god first above all. That's what works for me . Thanks again for your service and hope you have a prosperous new year ! A goodly number of aftermarket hoods were not made with the correct dimensions. Suggest you measure it and compare with another you know fits correctly. Most of all remember you are supposed to have fun.